For the related military trainer, see Cessna 526 CitationJet. The Cessna CitationJet/M2/CJ series (Model 525) are light business jets built by Cessna and part of the Citation family. Launched in October 1989, its first flight was on April 29, 1991, FAA certification was awarded on October 16, 1992, first delivery happened on March 30, 1993, and by June 2017, 2,000 of all variants have been delivered. Powered by two 1,900 lbf (8.5 kN) Williams FJ44s, it uses the Citation II's forward fuselage with a new carry-through section, straight wing, and T-tail. The basic model was updated with the CJ/CJ1/M2 names, it was stretched in the CJ2/CJ2+ delivered since 2000, then further in the CJ3/CJ3+ delivered from December 2004 and finally in the CJ4 delivered since 2010. Cessna launched the $2.4 million model 525 CitationJet at the October 1989 NBAA convention in Atlanta, estimating a demand for 1,000 aircraft over ten years. Succeeding the 700 original Citation Is produced since 1972, first flight was scheduled for spring 1991, FAA certification in October 1992 and deliveries by the end of the year. Its first flight was on April 29, 1991, FAA certification was awarded on October 16, 1992, and first delivery happened on March 30, 1993. Twenty years after its first flight, 1,450 CJs have been produced. As of June 2017, 2,000 of all variants have been delivered with five million hours flown. The six-seat CitationJet is a low-wing cantilever monoplane with retractable tricycle landing gear and a pressurized cabin, engines are pylon mounted on the rear fuselage. The jet uses the Citation II's forward fuselage, a new carry-through section, a new laminar flow, supercritical wing developed with NASA and Boeing, and a T-tail. Powered by two 1,900 lbf (8.5 kN) Williams FJ44s, the 10,000 lb (4,500 kg) aircraft has a trailing link undercarriage for smooth landings and can be flown by a single pilot. Cabin length is reduced by 1 ft 6 in (46 cm), range is 1,500 nmi (2,800 km) with four passengers and it can cruise at 437 mph (380 kn). 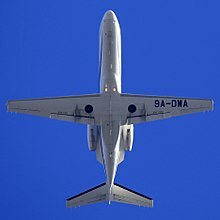 Its FJ44 bypass ratio is 3.3:1 with a 16:1 overall pressure ratio, its wing area is 240 sq ft (22 m2) and it can cruise at Mach 0.7 (413 kn; 764 km/h). It features EFIS avionics, its fuselage is 11 inches (27 cm) shorter than the Citation I's, but has a lowered center aisle for increased cabin height. Model 525 serial numbers 0001 to 0359, powered by Williams FJ-44-1A turbofans, are marketed as the CitationJet. Model 525 serial numbers 0360 to 0599 are marketed as the CitationJet CJ1 and are powered by the same Williams FJ-44-1A. It was improved with a more-modern EFIS avionics suite and a moderate increase in maximum takeoff weight. Model 525 serial number 0600 and higher are marketed as CitationJet CJ1+ and are powered by Williams FJ-44-1AP turbofans. With the same airframe, it has an updated avionics package and FADEC engine control. The GE Honda HF120 engine was announced as a retrofit option for the CJ/CJ1/CJ1+ in 2014. Model 525 marketed as Cessna Citation M2 are powered by improved FJ44-1AP-21 turbofans offering 10 to 15% more cruise thrust and up to 5% more hot-and-high thrust, and are equipped with modern Garmin G3000 avionics replacing Rockwell Collins Pro Line 21. Launched in September 2011, it is based on the then out-of-production CJ1 variant and features a new cabin layout and a more efficient FJ44 version. The initial M2 prototype first flew on 9 March 2012, it was not a conforming airframe but was testing the Garmin G3000 avionics and Williams FJ44-1AP-21 turbofans while one another aircraft was expected to join the certification program in May 2012 to be used for aerodynamics testing. With 150 produced since introduction in 2013, it became Cessna's entry-level jet after the Citation Mustang stopped production in May 2017. Model 525A serial numbers 0001 to 0299, marketed as the CitationJet CJ2 is a 5-foot stretch of the CJ1 (Model 525) powered by Williams FJ44-2C turbofans and first delivered in 2000. Model 525A serial numbers 0300 and higher, marketed as the CitationJet CJ2+ and first delivered in April 2006, offer increased performance with updated avionics and Williams FJ44-3A-24 turbofans with FADEC control. In 2014, Cessna started offering an upgrade package for the CJ2+ called Alpine Edition. It incorporates Garmin G3000 avionics and new cabin stylings similar to those introduced by Cessna to the CJ1+ when it became the M2. The CJ2 went out of production due to low demand in January 2016. Model 525B are marketed as the CitationJet CJ3 are a further stretch of the CJ2 powered by Williams FJ-44-3A turbofans. Unveiled at the September 2002 National Business Aviation Association convention, it first flew on April 17, 2003, was FAA certified in October 2004 and deliveries began in December of that year. The cockpit with Rockwell Collins avionics is designed for single-pilot operation but can accommodate two crew members. Its customizable cabin typically has six club seats in a center-style configuration with an accessible in flight baggage compartment and external baggage access. Garmin G3000 avionics. FAA certified in 2014. Between its production debut in late 2004 till spring 2018, 500 have been delivered, 2004-2009 models are sold for $3.5 million and $5.0-5.5 million for 2009-2014 models. It can cruise at its Mach 0.737 (423 kn; 783 km/h) MMo at FL450 over 1,900 nmi (3,500 km) with four passengers, or more than 2,000 nmi (3,700 km) at a slower speed, exceeding Textron predictions. Hourly, it burns 165 US gal (620 l) its engine maintenance cost $313.60, its parts $251.72 and labor cost is $298. The stretched CJ4 was launched at the October 2006 NBAA conference. Its wing design comes from the moderately swept wing of the Citation Sovereign. Powered by Williams FJ44-4A turbofans, it has a maximum range of 2,165 nmi (4,010 km). Its cabin is 21 inches longer than the CJ3 and can seat up to nine persons plus one in the cockpit. It first lifted off on May 5, 2008, from McConnell AFB in Wichita, Kansas and first deliveries started in 2010. We are adopting a new airworthiness directive (AD) for certain Cessna Aircraft Company (Cessna) Model 525C airplanes. This emergency AD was sent previously to all known U.S. owners and operators of these airplanes. This AD requires replacing certain lithium-ion batteries installed as the main aircraft battery with either a Ni-Cad or a lead acid battery. This AD was prompted by a report of a battery fire that resulted after an energized ground power unit was connected to one of the affected airplanes equipped with a lithium-ion battery as the main aircraft battery. We are issuing this AD to correct the unsafe condition on these products. ^ a b c Gerard Frawley. "Cessna CitationJet, CJ1 & CJ2". The International Directory of Civil Aircraft – via Airliners.net. ^ a b "Textron Aviation celebrates light jet leadership with 2,000th delivery for Cessna CJ family" (Press release). Textron Aviation. June 8, 2017. ^ a b c "Purchase Planning Handbook" (PDF). Business & Commercial Aviation. Aviation Week Network. May 2018. ^ a b "Cessna steals NBAA limelight". Flight International. 14 October 1989. ^ Robert Goyer (June 27, 2011). "Cessna's Amazing CJs". Flying. ^ "Cessna forsees large market for new, $2.4-million CitationJet". Aviation Week. Oct 9, 1989. p. 38. ^ "New Cessna Citation CJ1 Receives FAA Type Certification" (Press release). Textron Aviation. June 20, 2005. ^ Chad Trautvetter (18 September 2014). "Sierra Selects GE Honda HF120 for Sapphire CitationJet Upgrade Program". Aviation International News. ^ Fred George (September 26, 2016). "Operators Survey: Cessna Citation M2". Business & Commercial Aviation. Aviation Week. ^ "Cessna Launches New Light Business Jet: Citation M2" (Press release). Textron Aviation. September 26, 2011. ^ "Cessna Launches M2 Flight Test Program". Aviation Week & Space Technology. March 16, 2012. ^ Chad Trautvetter (May 11, 2017). "Textron Ceases Production of Cessna Citation Mustang". Aviation International News. ^ "Cessna's Citation CJ2+ Receives FAA Type Certification" (Press release). Textron Aviation. Oct 3, 2005. ^ Cessna (25 March 2014). "Cessna CJ2+ Alpine Edition". Retrieved 2 April 2018 – via YouTube. ^ "Cessna Ceases Production Of CJ2+ Jet". AVweb. January 7, 2016. ^ Cyrus Sigari (September 2014). "A plus for the CJ3". AOPA Pilot. p. T-10. ^ Juliet Van Wagenen (5 September 2014). "Cessna's CJ3+ Receives FAA Certification". Aviation Today. ^ Fred George (Apr 20, 2018). "Citation CJ3: Cessna's Best-Ever Light Jet?". Business & Commercial Aviation. ^ "Cessna Launches Citation CJ4 at NBAA; Starts Show with 70 Orders" (Press release). Textron Aviation. October 16, 2006. ^ "Cessna Citation CJ4" (PDF). Business & commercial aviation. Aviation week. January 2010. ^ "Airworthiness Directive 2011-21-51". Federal Register. November 1, 2011. ^ "Citation M2 Specifications". Cessna. ^ "Citation CJ3+ Specifications". Cessna. ^ "Citation CJ4+ Specifications". Cessna. Wikimedia Commons has media related to Cessna Citation M2. "Type-Certificate Data Sheet - 525 (Citation Jet) - Textron Aviation Inc" (PDF). European Aviation Safety Agency. 17 December 2015. "Type Certificate Data Sheet No. A1WI" (PDF). Federal Aviation Administration. April 18, 2007. "Photos - Cessna Citation M2". Flying. November 11, 2013. Fred George (Sep 10, 2015). "Cessna Citation M2 : Pilot Report". Business & Commercial Aviation. Aviation Week. Matt Thurber (October 13, 2015). "Pilot Report: Citation M2". Aviation International News. Archived from the original on 2015-10-14. "Citation M2: New Entry-Level Jet from Cessna". Flying Magazine. 27 September 2013. "Flight Test: Cessna strengthens Citation pedigree with CJ3+". Flight Global. 21 October 2016. This page was last edited on 26 March 2019, at 11:20 (UTC).